Higher education is usually associated with degrees in the Arts or Sciences, but community colleges across the nation offer certifications and associate’s degrees in many different trades not usually linked to academics. 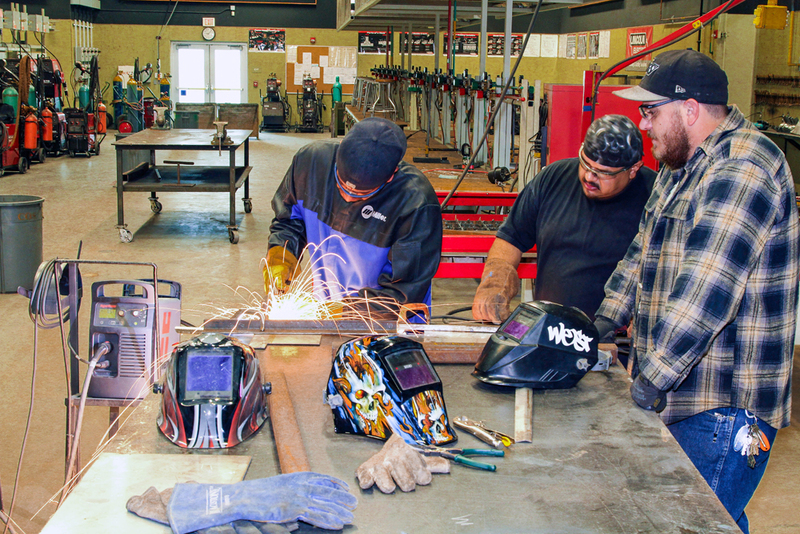 At the College of the Sequoias (COS), Tulare Campus, students can earn their American Welding Society SENSE Level One Certification, and if desired, can continue their education to earn an associate’s degree in the trade. COS is part of a coalition of community colleges (C6 TAACCCT Grant) who embed English and mathematics with their certification programs. This can be problematic. Students who want to earn Industrial Maintenance and Welding Certifications often have no desire to learn traditional academic discourse. This is where I come in. My task as an English instructor is to get welders excited about English, or at least hide basic skill English lessons within their everyday curriculum. If nothing else, this was daunting, and I had heard stories of other instructors who had failed to engage their welding students with English discourse. Then I met three welders, and everything changed. My first goal was to get the welding students to write, so Welding Instructor Randy Emery and I came up with the idea that I would teach resume and cover letter writing classes – something the students could use after they graduate. Unknown to them, I was also teaching them English skills. During our first meeting, Emery told me about one of his students. His name is Michael West, and at the time he was a 23-year-old student from Visalia, California struggling with dyslexia. During our first resume workshop, I asked West if he would like some help. When he agreed, I had him buy Dawn by Elie Wiesel, and arranged to meet him the following Monday to read. After that first successful session we agreed to meet every Monday and Wednesday for an hour. Then something unexpected happened. On Wednesday, West showed up with two other students: Michael Rubalcaba, a 36-year-old student from Tulare, and Juan Vargas, a 36-year-old student from Visalia. “I was having trouble with reading comprehension and my homework, and I overheard Mike talking about the reading group, so I joined,” Vargas added. “It has made me more confident in myself, and my comprehension has improved – COS is like a second home.” The others agreed. From left to right: Juan Vargas cuts a piece of metal with a plasma cutter as Michael Rubalcaba and Michael West wait to weld the cut piece to a combined project at the College of the Sequoias, Tulare Campus, welding shop. All three will graduate in May with an American Welding Society SENSE Level One Certification. On the outside, these gentlemen look like your normal cross section of a community college population, which is culturally, economically, socially, and developmentally diverse. I soon learned that these students, as well as many in the welding program, came to COS as a second chance to make something of their lives. West never spent time behind bars, but many other welding students can’t say the same. Vargas and Rubalcaba have spent time in the California penal system, but they are determined not to let their past dictate their future. After a month, I asked the group if they wanted to journal. In other words, I would get journals and we would free write during some of our time together. They seemed excited. As these students gained confidence with academic discourse, they also learned that they could rely on each other for help inside and outside the classroom; that their pasts don’t define who they are now, or who they will become in the future. “These people [instructors] never judged us; never gave up on us, and because they believed in us, we started to believe in ourselves,” Rubalcaba said. They started to believe in each other. “I actually rather be here than at home,” West added. The C6 TAACCCT grant was designed to help trade students build on their English and mathematic skills, which they could parlay into success in the job market. But for these students, the grant also provided a sense of self; a common bond of mutual respect, admiration, and the desire to help each other succeed in and out of school. “We are even talking about helping each other after the program,” Vargas said. “The whole English aspect, the resume classes, cover letters, communications skills, and our reading group has been awesome – astonishing – it has been a life changing event.” – Rubalcaba and West agreed. Not only has it been a life changing event for these students, but for me, their instructor. Jon E. Stern is an English Instructor at the College of the Sequoias and a freelance journalist. Muy interesante que tratemos todos de superar nuestras falencias. mucha suerte!. I’m call Paul, I work for GLOMAE Inc. I have gone through educative program and found it very interesting, and I will my training center to work in partner with you, so I wish you people could send the following requirements to intergrate into you system. Jon, what an amazing thing that you and your colleague, Randy Emery, thought of doing! I was really touched by this story and because a lot of the welders I get to help find work are rougher around the edges, sometimes I get shy about asking if they need help with their resumes. This anecdote has helped me get back in touch with the human element of those I help get to work. I am curious though, why Dawn by Elie Wiesel? Hi! Thanks for this post. I am the English teacher for a new linked learning Welding and Fabrication pathway that is starting in the fall at my high school. It will be a 3 year program, starting in the 10th grade. Students in this pathway will take Welding, English, World History, and Technology courses as 10th graders–all with curriculum related to industry. Have you got any additional advice for me and my team as we attempt to integrate reading and writing experiences that are relevant to the welding and fabrication industry? Are you still writing the blog and teaching welders English skills? I just started teaching an English course for students getting certified in welding. Same journey as you, except I already have the special ed background to help those with academic barriers such as ADD and Dyslexia. I’d like to hear from you what else you have done to develop the course. Coming up with “sneaky” writing assignments has been a challenge!